If you are discipling someone, I’d like for you to share this article with them. You will not find better counseling advice than what I’m going to share. I have also included a few assessment questions that will help you to care for them more effectively. When I completed my BA in Theology program in 1990, my pastor asked me what I learned from four years of studying the Bible. I thought it was an odd question—and I did not have a quick or smart answer. I remember standing with him trying to come up with something profound. After a few minutes, I still had nothing. I thought about dozens of classes, e.g., hermeneutics, the Gospel of John, Bible geography, and homiletics. There were too many classes and too many years to consolidate down to a tweet. One-hundred-twenty-eight credit hours. Impossible. And then it hit me like a bolt of lightning against a clear night sky. In four years of training, are you ready? Here it is. After all the years, all those lectures, and a mountain of work, the thing I learned and the thing that I came to cherish most of all were two. That was it. It was not profound, but it was transforming. After I told my pastor what I had learned, I felt a little embarrassed because I knew these two critical things before I left for college. Ironically, I got all that education and came back with those two nuggets. Here I sit all these decades later, and I’m more convinced than ever of the truth of those two things. Not only have I seen the benefit of them when I do them, but I have seen the detriment to my soul and my relationships when I do not practice these disciplines. Two of the most common traits that I have seen in a person struggling in his sanctification is his lack of regular transformative Bible reading and consistent time in prayer with his Father. It is exceptionally rare ever to counsel a person who is struggling in his sanctification or struggling with others and find he has a disciplined time with his Creator and His Word. The next time you are helping someone, ask them to describe to you his prayer life and Bible study. Ask him to give you the details of these disciplines for today–and for this week. The overwhelming response I have received from folks is sparse to nonexistent time with God or His Word. If you attempt to disciple him, but neglect to appeal to him to change his relationship with God and His Word, your discipling will not work because you will get the cart before the horse. You will not be able to help him until he decides to make these changes, as evidenced by going to the Solution-Giver for his problems. If he has not been going before the Father through prayer and His Word, your counsel will turn into legalistic suggestions that will not sustain him. Only God can sustain you, and if you are not going to Him for your daily sustenance, you need not expect your life or our relationships to be transformative. What makes Christian counseling or discipleship radically different from our culture is our privilege to be connected to the Source of life and change. You don’t want to map your soul care over a prayer-less person who does not read his Bible regularly. If so, there is a strong chance you may become frustrated, and he won’t change the way that he could. Jesus was not stuck on Himself by suggesting that you can do nothing without Him. He was stating the truth: you can’t do anything without Him. This truth does not mean you get a big gulp at salvation and you don’t need Him any longer. Along with that big gulp of salvation, you need His daily wisdom and interaction as you change progressively into His image. The two most important ways this will happen are through daily prayer and Bible study. Sometimes a wife will tell me that she thought something was amiss with her husband, but could not put her finger on it. There are other times when a husband will share with me a similar story about his wife. It should not be a mystery to figure out a spouse or a friend. A quick way to assess the actual spiritual condition of someone is to have him describe to you their prayer life, as well as their daily Bible consumption. Ask them to give you the details of their time with God and His Word. Doing things like ministry, family time, and general busyness does not make you spiritual. Those activities should be born out of your spirituality, not your self-reliant will to accomplish stuff. It can be easy to assume a person is doing well by the things you see them doing. This myopic assessment is not only a dangerous assumption, but it’s a legalistic way of assessing someone’s life. You must not make a person’s works the measuring stick of their spirituality. Leading a Bible study, working on a church staff, pastoring, or facilitating a small group are not the things that make a person close to God or what gives individuals spiritual strength, wisdom, and character. Our spirituality comes from God and the things you do flow out of your time with God and His Word. If you are not regularly connecting with God, you have a self-reliant model for ministering to others. Here is a list of questions that I want you to ask yourself, your spouse, and friends. Your answers will give you a better diagnosis of your soul condition than the things you do. If you are struggling with any of the problems presented by my questions, I want you to reflect on the quality of your prayer life and Bible time with the Father. Are there character flaws in your life? Are you tempted to sin when you are around some people? Are you prone to grumble more than rejoicing? Are you willing to trust God regardless of the circumstances in your life? Are you characterized more by fear than faith? Is there something you’re more passionate about than God? Do you have an affinity for God’s Word? Do you look forward to engaging God in prayer? Are you content with your “thorn in the flesh,” whatever it may be (2 Corinthians 12:7-10)? If a person is struggling in any of these areas, an assessment of his prayer life and Bible time is critical. More than likely the struggler has a breakdown in his relationship with God, which you will discern by their lack of time spent with Him. This initial assessment must be the first place you begin your soul care endeavors. If you don’t, you will be laying wise counsel on top of a powerless individual, who will only be able to change according to his old, self-reliant methods. There are at least four kinds of prayers: Wow, Help, Thanks, and Please. Think through how you can implement all of them into your life. “Wow, dear Lord, you are amazing.” Wow-type praying is when you are overwhelmed at the bigness, greatness, and all-powerfulness of the Lord. When the finite tries to wrap his brain around the Infinite, all he can do is prostrate himself on the ground in stunned amazement. “Help me, dear Lord. I need you.” This type of praying gets at the heart of your needs. You are in that place again where you need help, and know the only person who can help is God Almighty, so you ask Him to impose Himself into your life and situation. “Thanks, Lord. You are so kind to me.” Then there are gratitude prayers. This one should be rolling off your tongue every waking hour. There is never enough time in the day to thank the Lord for all you have experienced from Him through your five senses. Gratitude praying should be the most frequent praying you do. “Please help my friend.” One of the highest honors you can bestow on a friend is to take their needs to the King of the universe. This kind of praying is Christlike, as it imitates the One who intercedes for you. Whether it is in structured or spontaneous moments, praying for others is a gracious gift to your friends and a sweet aroma before the Lord. When I talk about Bible reading, I am not talking about Bible reading for the sake of Bible reading. I’m talking about transformational Bible reading. This perspective is the kind of Bible reading that presses into your soul and changes you. My Bible reading changes all the time. I listen to the Bible in a year. I read the Bible in a year. I’ve read the Bible several times in a month. I also like studying passages. And I have memorized a lot of scriptures. Reading the Bible every day can build discipline, but you still can have the Acts 8:31 problem–how can I understand if someone does not help me, which is the reason I write so much. I have been journaling since 1994. The process of writing has helped me more than anything as far as applying God’s Word to my life. This discipline is part of what I mean by transformative Bible reading. If you are not practically applying the Word of God to your life, you are only filling your head with knowledge. Satan is an excellent Bible student, but his personal application of the Bible stinks. There are way too many Christians who have filled their heads with Bible knowledge, but they do not know how to live it out in practical ways. Some people who have come from legalistic backgrounds recoil when you begin talking about daily and disciplined Bible reading and prayer. These Christians have only one worldview for doing religious things. What they don’t understand is grace-motivated obedience. The legalist’s perspective is understandable because grace is always the antagonist of legalism and they have never had grace-motivated people in their lives. Do not neglect the importance of prayer and Bible study. Start keeping notes on the number of people you help who come to you who are not consistent in these two essential disciplines. If you don’t believe me now, you will after you make the comparison between those who are consistent in Bible study and prayer and those who are not. 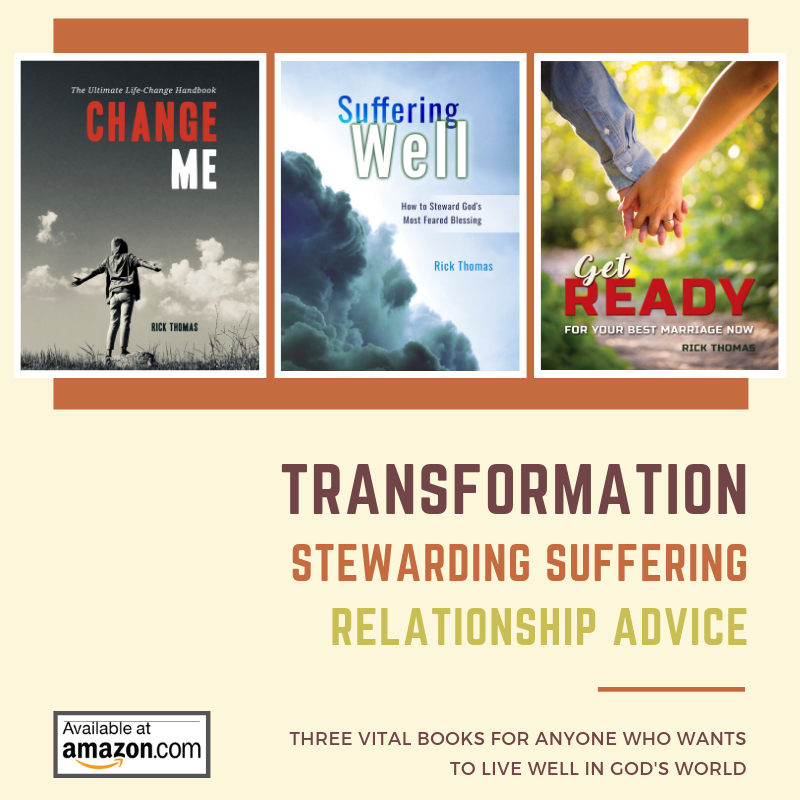 Helping strugglers can be an excellent opportunity for giving advice, but counseling is not what changes a person. God does this. If a person does not make time with God, through Bible reading and prayer, a cherished priority, your counsel will not have long-term, transformative impact on their lives. « Should I Keep My Friend’s Sin Secret?